This is a mobile application developed by St George’s, University of London. The aim of this application is to primarily assist undergraduate students in learning and revising psychiatry material and making resources more accessible on the go. The application may also be beneficial to others like postgraduate students, junior doctors, other health professionals and other students interested in psychiatry. 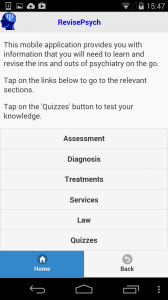 With the increasing volumes of information on the web this application helps to give an overview of a lot of essential information psychiatry students need to know. The App also has a number of instructions on how to carry out a few different types of OSCEs some which include a Alcohol Dependence station and Hypomania. 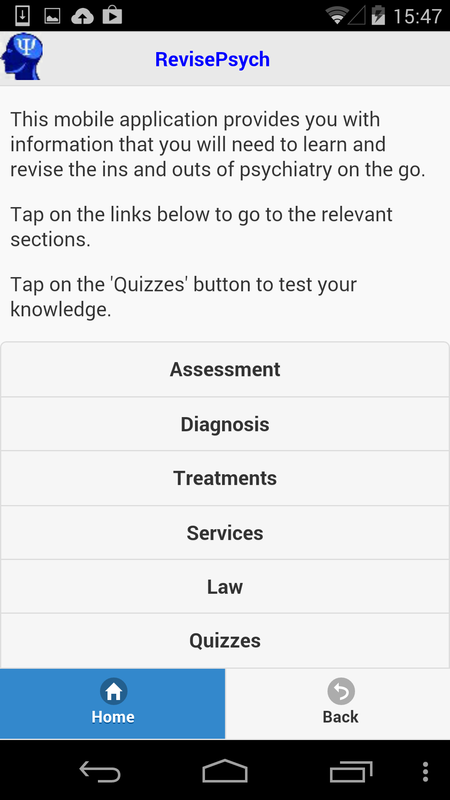 In addition to this, the app also includes some sample multiple choice questions to test your knowledge around psychiatry topics and some video clips too. More information about the content of the app can be found here. The App has been developed by the e-Learning Unit, St George’s, University of London in collaboration with the Psychiatry Team at St George’s, University of London.